Tomorrow is my last day working for Brisbane City Council. 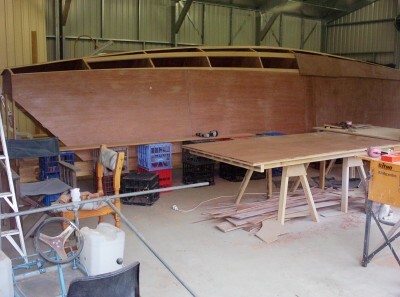 Hopefully, there's going to be more boatbuilding progress than there has been of late. This shot shows I'm nearly finished with sheeting the hull. Then there's lots of glassing, fairing and filling to do b4 starting on the next hull.